Ben Begaye Fox Turquoise Thunderbird Bracelet size 6 7/8"
Navajo silversmith Ben Begaye specializes in Traditional Revival designs. 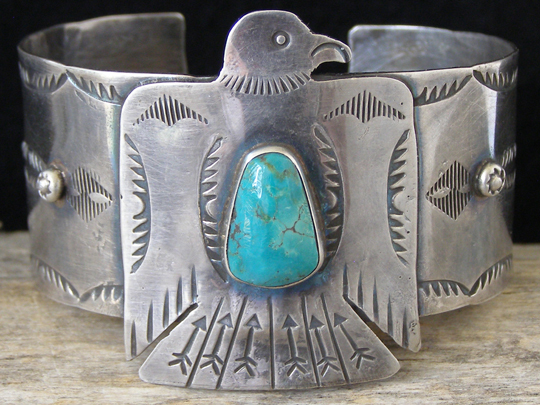 This thunderbird bracelet is reminiscent of Fred Harvey tourist jewelry of the thirties and forties. The design is made from lightweight Sterling sheet silver and, by virtue of this fact, the cuff has considerable flex. The gap in this cuff will open wider to put on and take off the cuff, then spring back to its size of one inch. The cuff can be altered to a larger size if required. Hallmarked B and stamped Sterling inside. Thunderbird: top of head to bottom of tail 1 3/4"